PSB Academy has two campuses in Singapore, a City Campus within Marina Square shopping (6 Raffles Boulevard) and a STEM Campus at Jackson Square (11 Lorong 3 Toa Payoh Blk A). 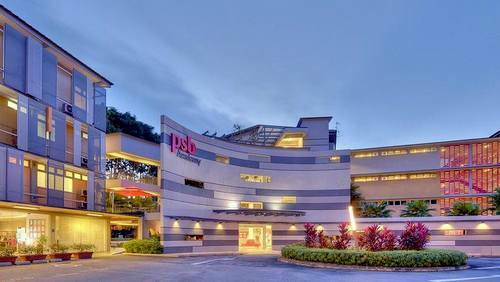 Originally a division of Singapore’s National Productivity Board (NPB), PSB has been a private institute for education since 2006, owned today by Intermediate Capital Group. PSB is known as “The Future Academy”, featuring an approach to education that focuses on what really matters: performance in the New Economy. Every year, the institute hosts over 12,000 students from over 50 nationalities with a slate of certificate, diploma, degree and postgraduate programmes. The schools of education for PSB are School of Foundation Studies, School of Business and Management, School of Engineering and Technology, School of Life and Physical Sciences, School of Postgraduate Studies, and Executive Education. Levels of education that PSB Academy offers, meanwhile, are Study Tours, Short Courses, Preparatory Courses, Certificates, Diplomas, Bachelor’s Degrees, Master’s Degrees, Doctorates, as well as Postgraduates. Of the campuses, the 100,000 sq ft City Campus at Marina Square opened its doors in 2017, while the 50,000 sq ft STEM Campus at Jackson Square in Toa Payoh (hosting Schools of Engineering and Technology and School of Life and Physical Sciences) has been in operation since 2018. The STEM Campus is dedicated to studies in science, technology, engineering and mathematics, having advanced laboratories and facilities for learning, experimentation and discovery. The official Facebook brand page for PSB Academy is located at www.facebook.com/psbacademy. PSB Academy also has an official Instagram account, which in turn is available at www.instagram.com/psbacademy/.